We were on the road, shooting down the interstate at 83mph in the 80 speed zone, naked. The plan was to make it to Cedar City for a long hot shower and a real bed. The next morning we had to get to Tucson for work on Monday. We grabbed a quick continental breakfast, but decided to stop into that fun little “everything homemade” restaurant for a brunch. We had a great meal again. 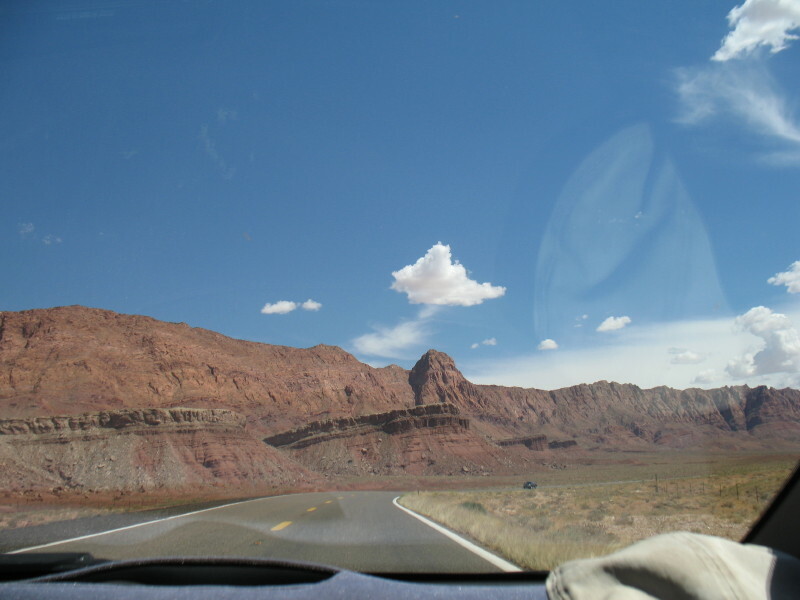 We had crossed through a scenic Highway 14, peaking at 9900 feet, through canyon’s vistas, forests, lakes and down into the wonderful red rock country on the way to that brunch. After that filling brunch, we are now ready for a full day’s drive and heading south. 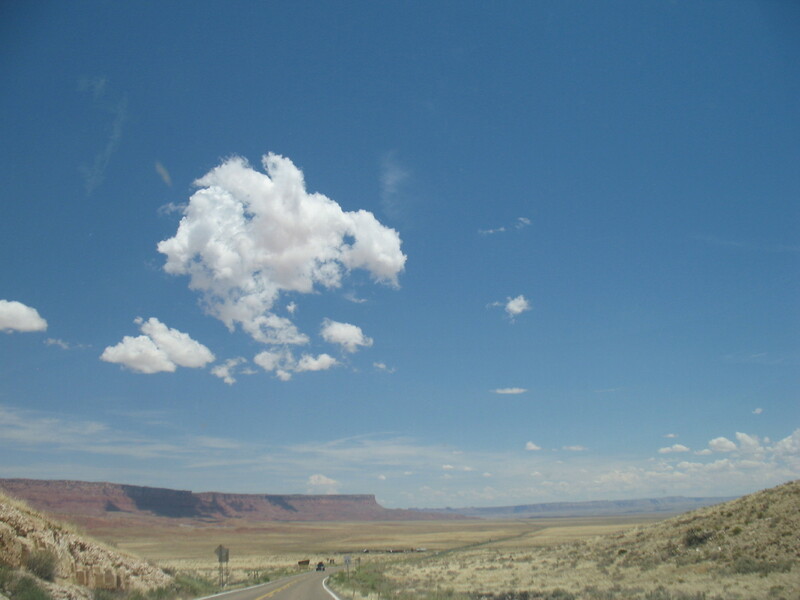 From Kanab, we shall explore the southern highway, this time, 89A. We can feel the warm desert air, as we gas up. It’s funny how we become so quickly acclimated to those high mountain temps, or shall I say spoiled. 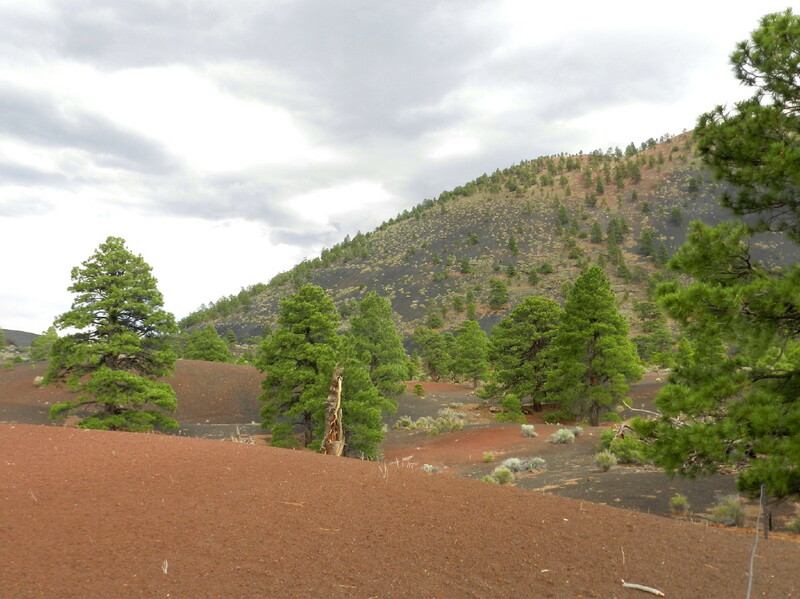 The terrain is red soil and desert expanse. 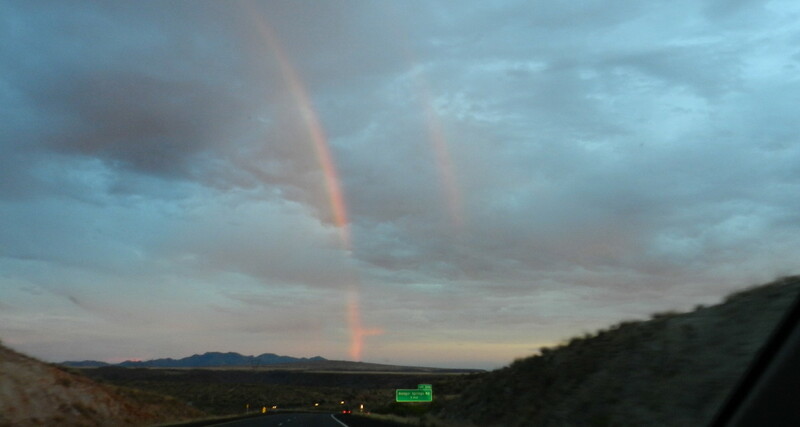 We see the sign declaring our crossing into Arizona, and then another that strikes a chord of excitement. 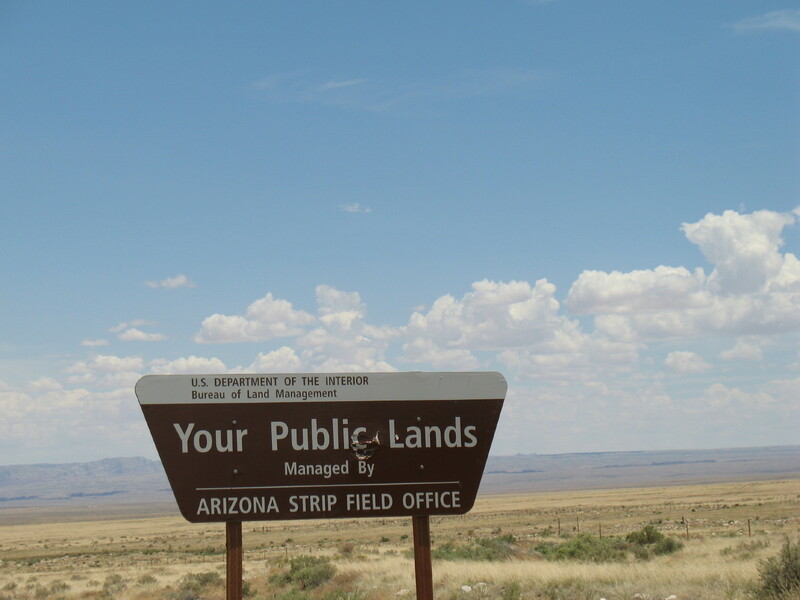 It reads, “Your Public Lands, Managed by, Arizona STRIP Field Office.” You don’t have to tell me twice! I become bare within seconds. 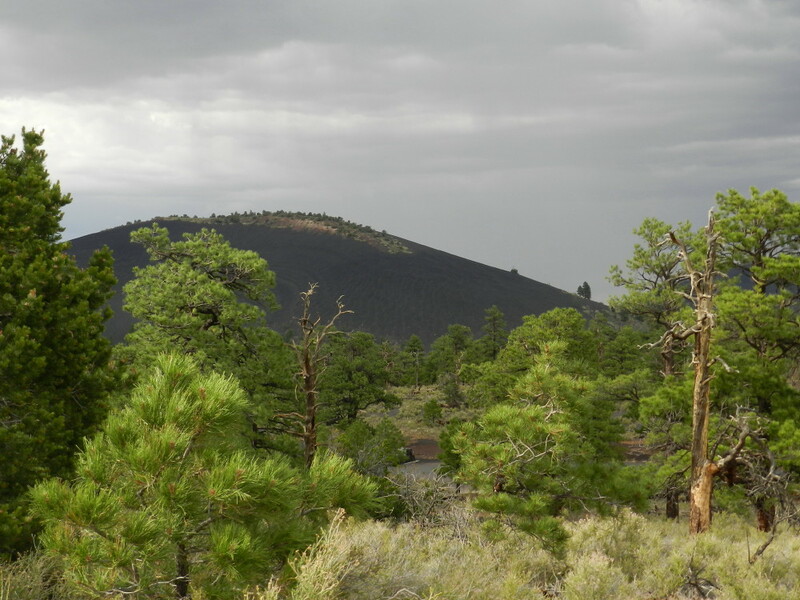 The road begins leading us through the desert, then some pinion pine, then higher into a tall pine forest. 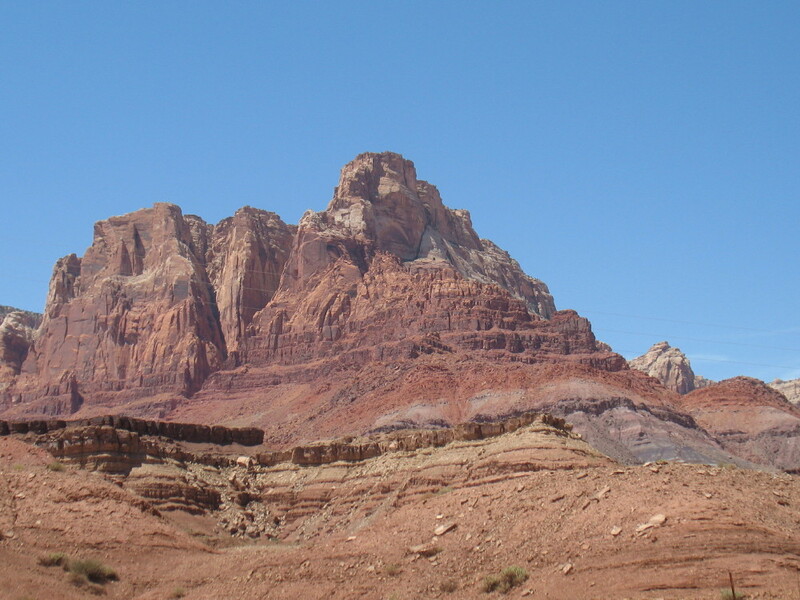 It then drops down, through a funnel, which cuts through a hill, we begin to see the famous Vermilion Cliffs. 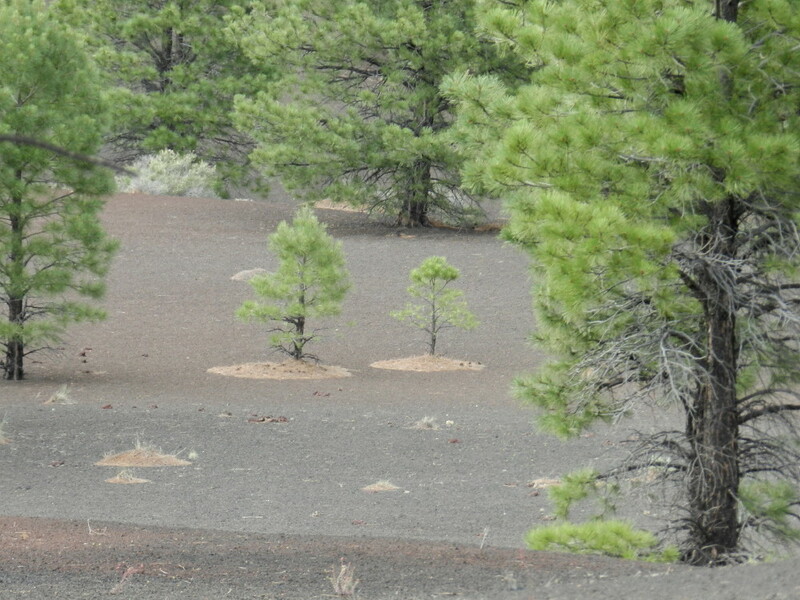 The desert plateau is back and we can see the Grand Canyon cutting it in two. 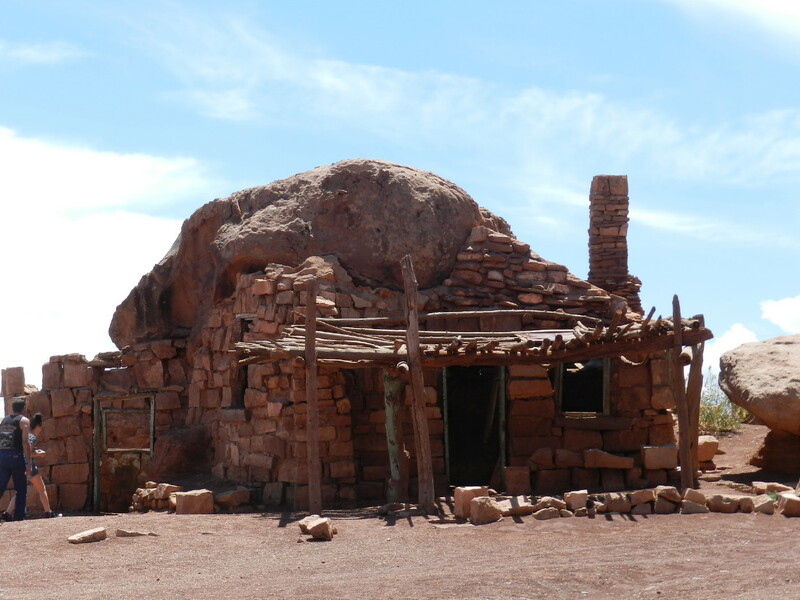 We stop along the roadside to visit the rock dwelling that a woman created back around 1930. We slip on covering. 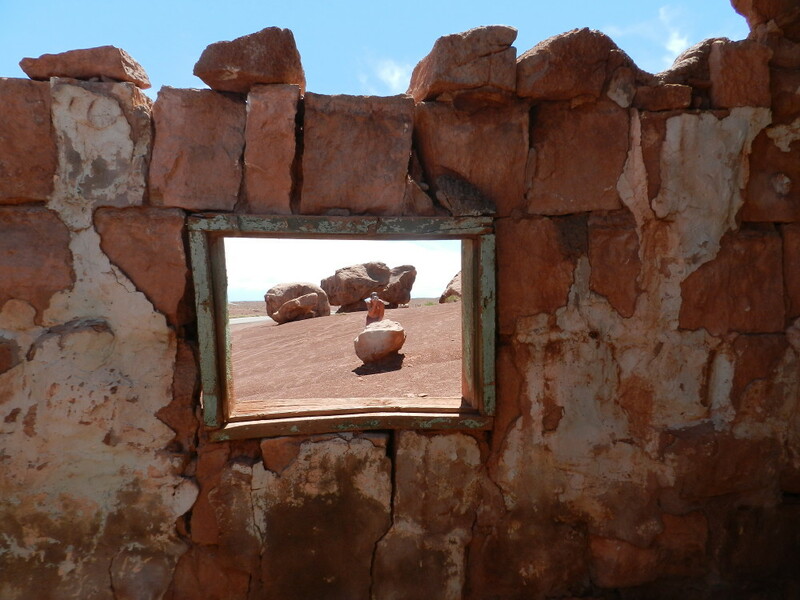 There are huge boulders just sitting around on a sandy barren plain and she has created a home, thoroughly integrating with the shape of the rock. It is now part of her roof and walls. After stopping there herself in 1927, she had overwhelmingly fallen in love with the vistas and decided to stay. I’m going to dig deeper to find out more about this remarkable woman and her lifestyle. In 1930, she was not typical. In 2014, she is not typical. 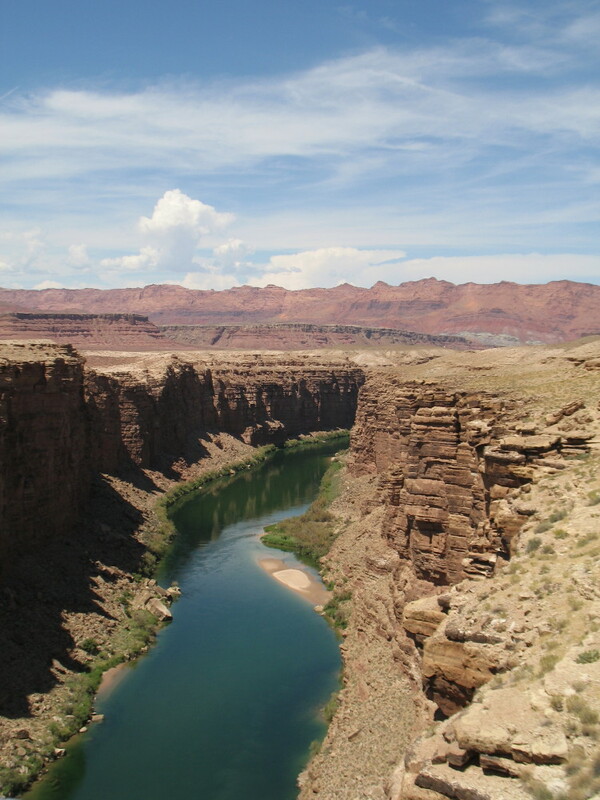 The next impromptu is Navajo Bridge. 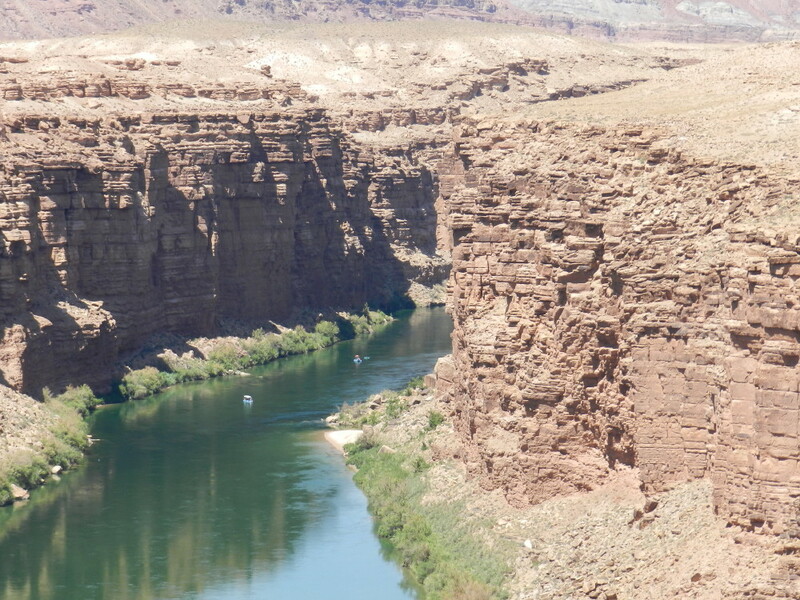 This replaced Lee’s Ferry, the only crossing over the Grand Canyon for hundreds of miles, at the time. We walk across the now pedestrian bridge, watching rafters 467 feet below. There is a curious sign there as well. It read, “No Jumping off of the Bridge!” We just can’t quite grasp the necessity. On the other side, I became a poser for a photo op. We begin the cruise to Flagstaff, which is just as interesting the second time. DF is driving, unusual on a trip, but still has her clothing on from our two stops. I’m compelled goad her about driving cross country naked. She pulls over. 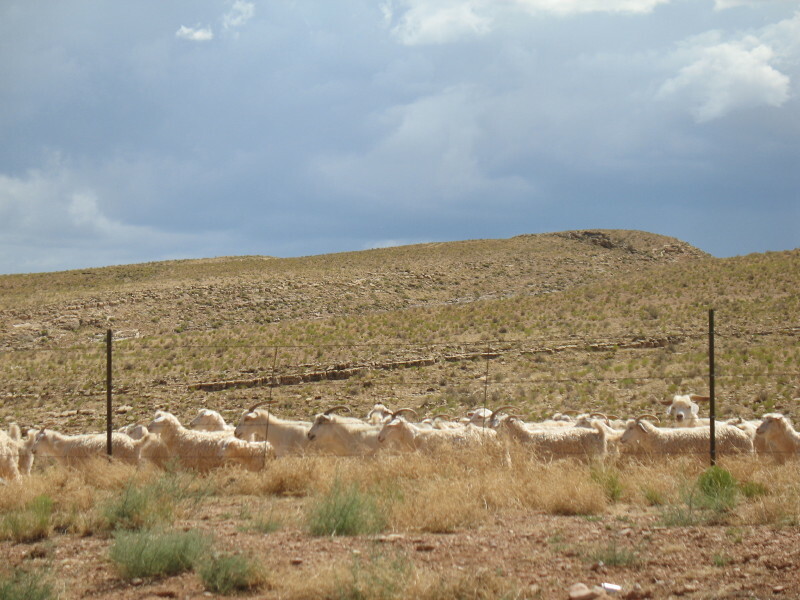 I take photos of Navajo sheep watching us, as she disrobes properly, within seconds. 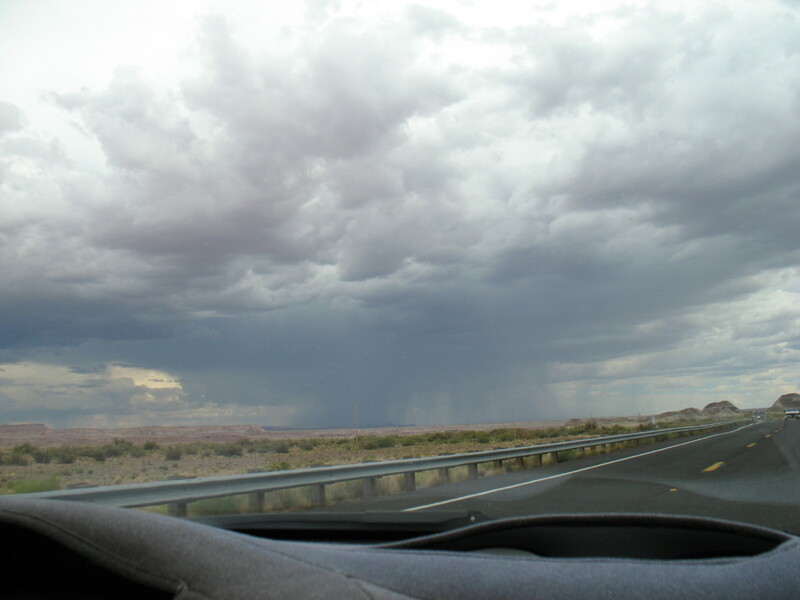 We continue across the desert attempting to avoid the thunderstorms that are crossing our path in the distance. One catches us. A deluge, a curtain of large drops, pummels everything forcing us to slow down in the poor/pour visibility. Then, it is gone on its way. 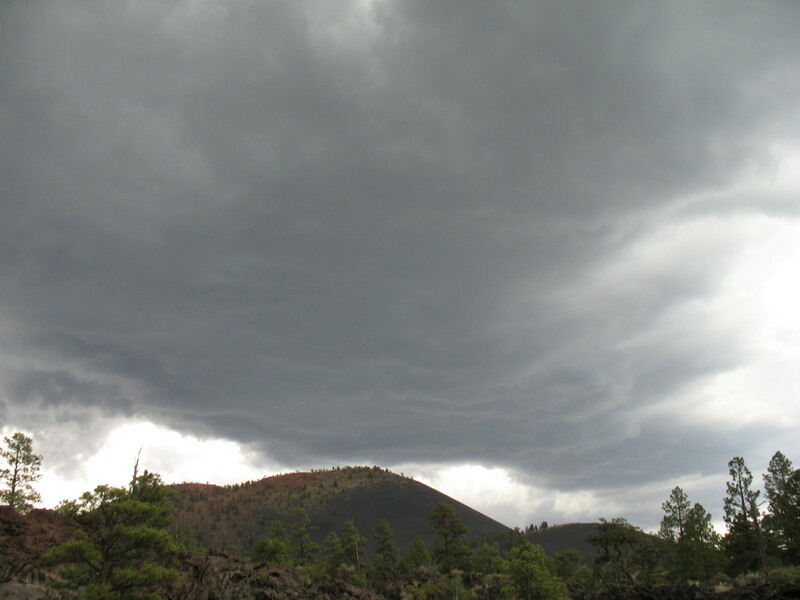 We decide to take the extra time, since we are in the area, and visit the volcanic craters north of Flagstaff. The access to the actual crater is limited. It is getting late in the weekend and I manage to do most of our touristic exploration without the bother of getting dressed. I listen for approaching cars with a pre-planned contingency as to how to avoid being seen. It is classic stealth naturism. 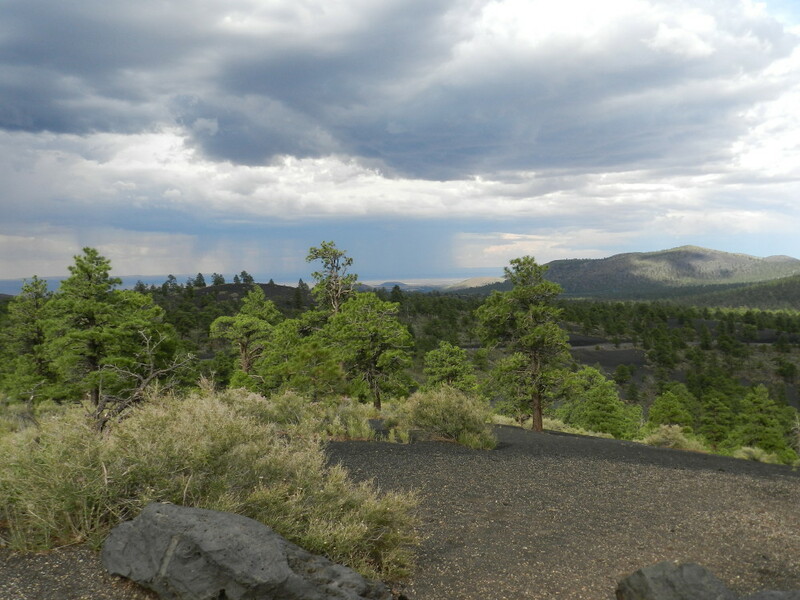 The threatening rainstorms create different types of air experiences of intensity, humidity, temperature and smell, which augments my experience of this unusual landscape. The volcanic world is sometimes surreal and very foreign. It is fortunate to be able to experience it fully. 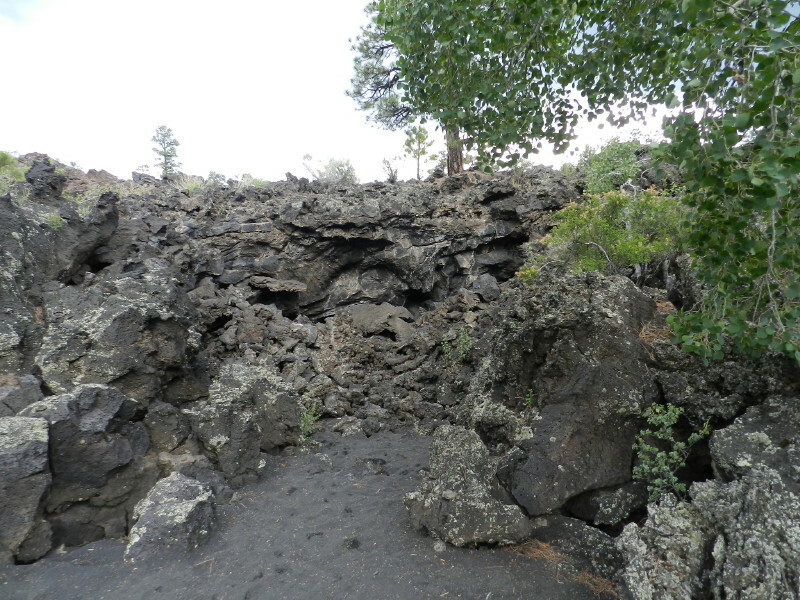 We walk across black deposits from the volcano and there is stuff growing all over the place. It is gnarly shredded remnants of the flow of just dried material pushed up by molten mass. Sparse vegetation of pine or aspen is just getting a toe hold here and there. These were formed less than 1000 years ago. Pretty much fresh. 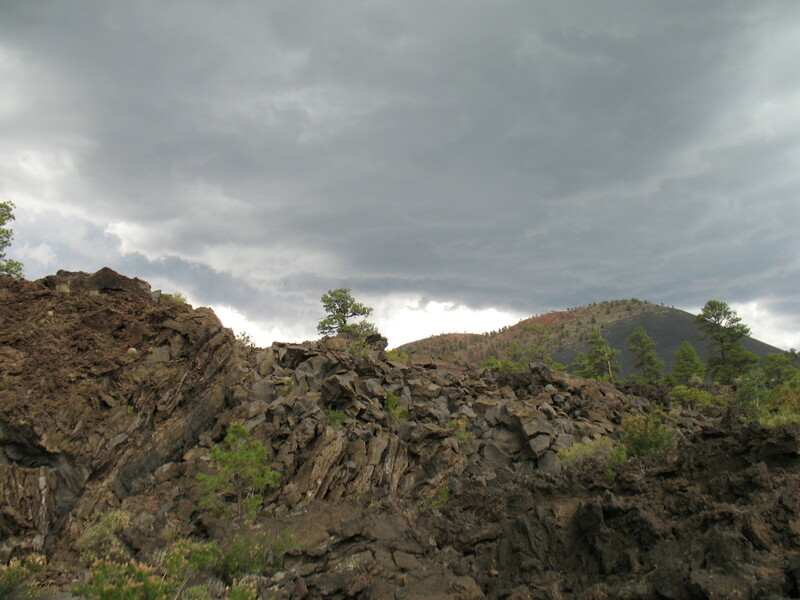 The dull black and rusty soil with sparse veggies coupled with the incoming Mordor-like black cloud formation of the thunderstorm give an ominous appearance. 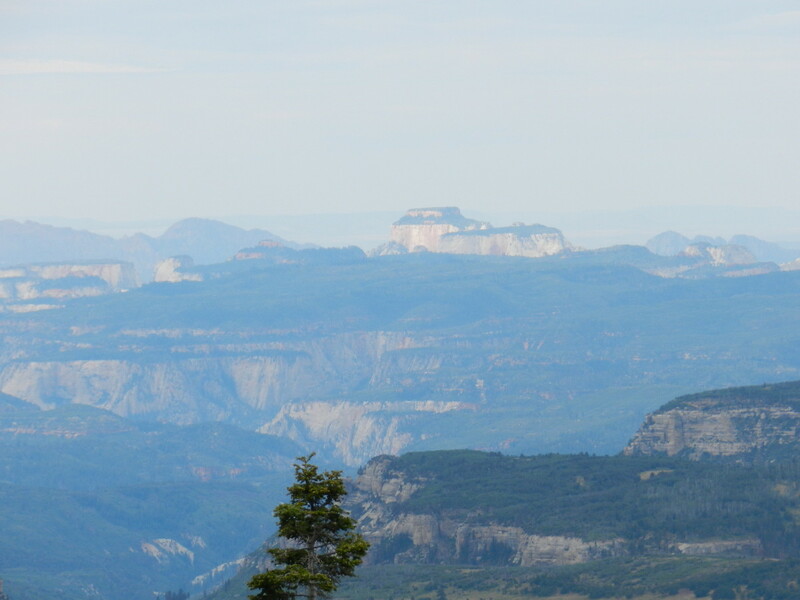 After the last gas-up, we are descending through the vistas near Sunset Point. Rain burst had threatened us that afternoon, even deluged us like hard fog at one point. 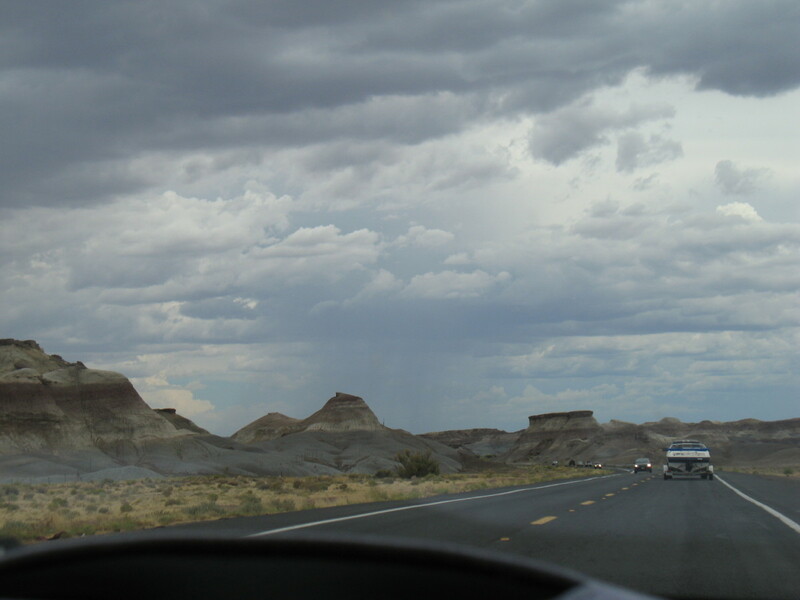 We had managed to dodge the massive formations generally, as we watched these traveling cloud bursts make their way across the vistas. Suddenly, there before us burst a huge double rainbow, just as the sun set. 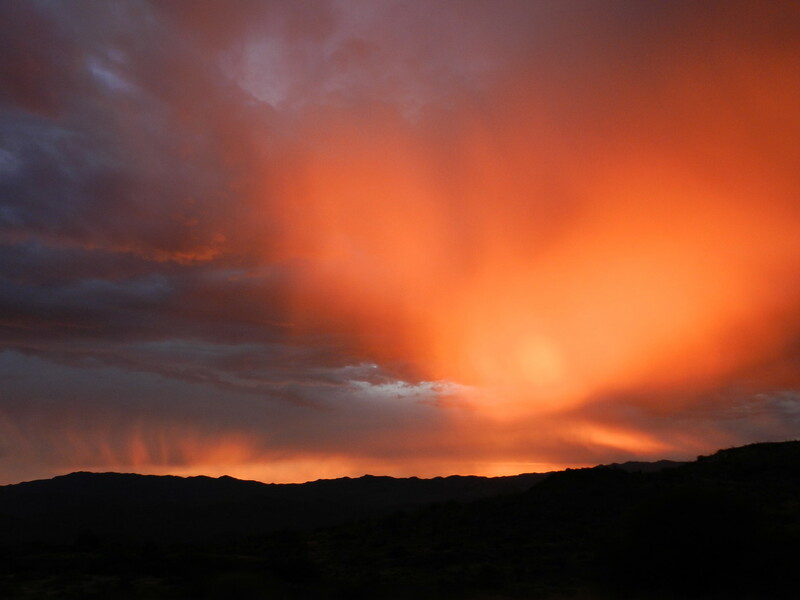 To the west the sky is filled with a dramatic golden glow.